Hockey Rink Netting. Keep your pucks IN your ice rink. I added a protective hockey rink netting to my backyard ice rink the winter following the season my son was able to take decent wrist shots. As soon as the snow melted, both my neighbors were nice enough to pleasantly return a little over 60 pucks to me. They did not say anything, but I felt a little uncomfortable. I remember thinking that my son and his friends would definitely be much stronger and better next winter, so I needed to protect the hockey spectators (neighbors) with protective hockey rink netting. I needed to make sure all those pucks didn't end up in my neighbor's yards. MYBACKYARDICERINK has many types of excellent high-quality protective hockey rink netting, available with many options and colors such as black, white, monofilament, kevlar, with or without eyelets. 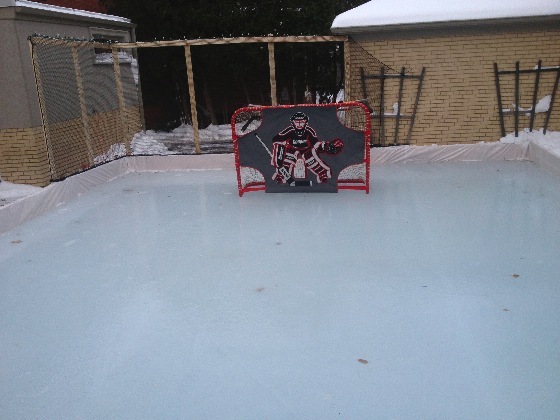 To have you own hockey rink nettng designed and manufactured, please visit our online store. We can customize them to your exact requirements. Please send me your postal or zip code when asking for customized pricing. 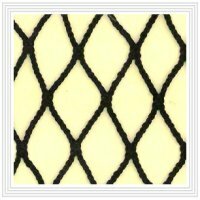 We offer netting got outdoor and indoor use and to stop fast-flying hockey pucks. Please send me your postal or zip code when asking for customized pricing. Protective netting is a little expensive but well worth the investment. My son and friends can now take as many wrist shots and slap shots as they want and as high and as hard as they want! 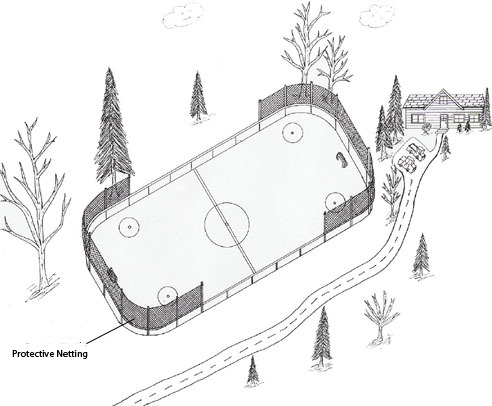 During the summer I customized my own protective hockey rink netting to fit my ice rink, as in the drawing above, in order to meet my exact specifications. If anyone needs to make their own customized protective hockey rink netting to fit their rink, send me an e-mail and I will be more than happy to help out. 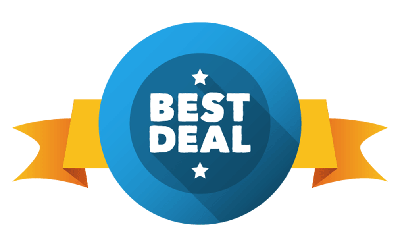 "Hey John, just wanted to thank you for the great product!! Ice is frozen and my kid is ringing pucks off of the cross bar!! Enjoy the pic!!" I attached my hockey netting to 12 foot, 2' x 4's at each end of my rink behind our hockey goal nets running alongside the rink boards. Even though we have very good neighbors who have never complained, I do feel much better knowing that I am in no way disturbing my neighbors or their property by using the protective hockey netting. Visit our rink liner and a rink tarp pages.